The Rebel Sweetheart. : One FC: Warrior's Way | Brandon Vera leads pack of seven Filipino fighters. One FC: Warrior's Way | Brandon Vera leads pack of seven Filipino fighters. On December 5, 2014, 7 Filipinos will show their warrior skills inside the cage in front of the Filipino audience at the SM Arena. The pack of 7 will be led by none less, Brandon Vera, international MMA superstar who is set to have his debut fight for One FC that night. One FC: Warrior's Way is set to be the organization’s fifth stop in the country, and the star-studded card will feature seven Filipino superstars taking on foreign opponents. Jujeath Nagaowa, Ana Julaton, Rene Catalan, Honorio Banario, Kevin Belingon, Eduard Folayang and MMA superstar Brandon Vera are the seven Filipino stars set to feature on the card and the group form an impressive representation of the martial arts prowess of the Philippines. Both Jujeath Nagaowa and Ana Julaton have boxing pedigrees, with Julaton a former WBO and IBA Super Bantamweight Champion. Catalan, Banario, Belingon and Folayang all have a long list of accolades in Wushu and Brandon Vera is a kickboxing champion and one of the most highly touted fighters in recent history. 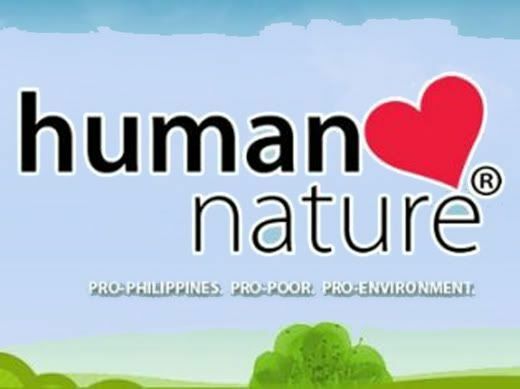 A win for any of the Filipino stars could put them up for title contention in a future event. One FC: Warrior's Way Fight Card. Jujeath Nagaowa is taking on Tharoth Sam, a female mixed martial arts pioneer from Cambodia. Ana Julaton, who arguably had the loudest ovation at the last Manila event, will be back in action once again to take on Egyptian kickboxing champion Walaa Abbas. Julaton has been training with some of the top wrestling coaches in the states and is eager to showcase her new grappling chops in this bout. Former ONE FC Featherweight World Champion Honorio Banario will look to make the climb back into title contention, but he faces a stern test in Brazilian Jiu-Jitsu world champion Herbert Burns. Belingon will be disappointed that he is not in the main event, considering he was dominating in a #1 contender bout against Dae Hwan Kim before succumbing to a submission. Dae now gets to compete in the main event and Belingon will be determined to gain a headlining spot. Eduard Folayang has another stern test in Russia’s Timofey Nastyukhin. Folayang has staked his claim for a title opportunity by defeating Vincent Latoel and former ONE FC Lightweight World Champion Kotetsu Boku, and a win over Nastyukhin will make it hard for the matchmakers to overlook his claims. The event will also see the debut of MMA superstar Brandon Vera in the Philipines. Fans in the country have been clamouring for an opportunity to see him live in action for more than a decade and will now get the chance at One FC: Warrior's Way. He will take on Igor Subora, a Ukrainian who has destroyed the regional scene in the Philippines. The clash of heavyweights is one of the most heavily-anticipated bouts of the year and will cap off the Filipino participation at this momentous event. 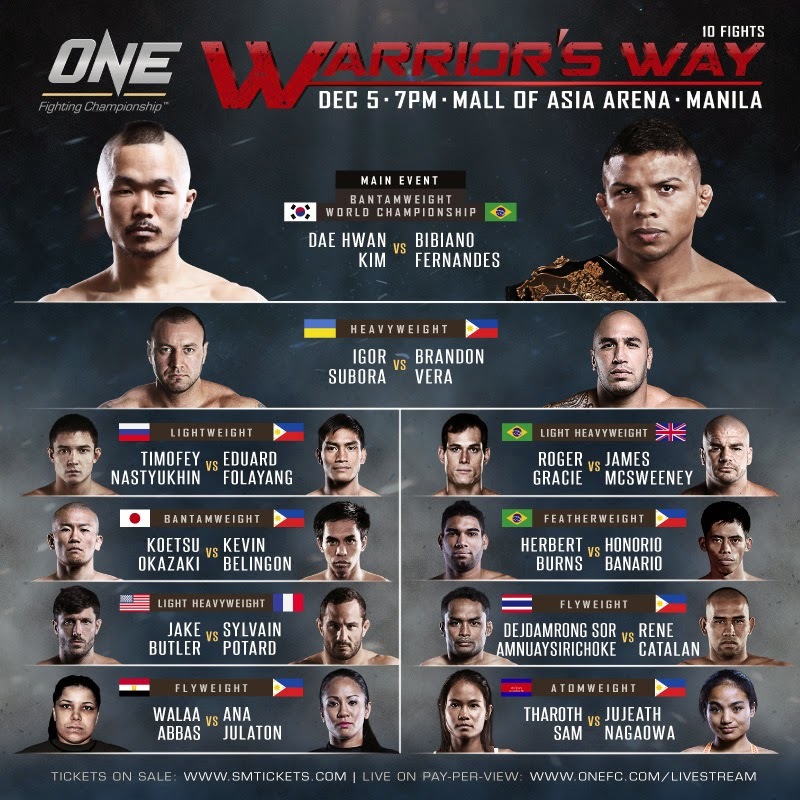 Tickets for One FC: Warriors Way on 5 December in Manila are on sale now at SM Tickets (http://www.smtickets.com). Ticket categories begin with the full Red Carpet and cageside experience for VIPs at PHP 6,360 followed by Patron PHP 3,180, Lower Box PHP 1,280, Upper Box PHP 640 and General Admission PHP 220. Prices include ticketing fee. Pre-sale packages are currently available.